He says "Yes 4 cams, Panasonic 450 video switch, Spyder for screen switch, Christie HD18k projectors." It means it's a pretty flexible setup. I like that Panny switcher, it has a lot of nice features. We've been looking at upgrading our gear at church and I listed the 450N as a possible replacement (although I'd prefer to go with a 2ME board if budget allows for the added flexibility). We're rocking two Christie Roadrunners for our front screens that are pushing 10k lumens each. They're the older design that uses four bulbs per projector and sound like a small jet engine when running. We're currently running the projectors and confidence monitors through an Autopatch matrix switch that I picked up off eBay a while back. Going to have to look in to those Spyder units, looks like it would replace a lot of gear in the rack and maybe even eliminate the need for a 2ME switcher. This was taken shortly after the video system was installed around 2004. We've moved to a bit more contemporary service since then and upgraded some parts of the sound system. Also added some up lighting behind the choir. The control room from a little over a year ago. We use robotic cameras, which is great that we only need one operator. I'd still like to add at least two more manned camera stations as the robotic pan/tilt heads take a lot of life out of the movements. We had a big production for the Fourth of July where we added two manned camera stations to the mix; ended up borrowing the Sony Anycast Station from our youth group to merge with the system to get enough inputs. 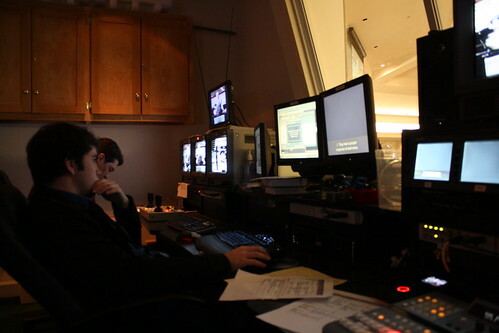 Ended up directing the technical side of the show and running the switchers; was quite the handful. I'm really looking forward to the equipment upgrade, should bring some much-needed simplicity to our setup. And with live productions, simplicity is key. Would love to work on some corporate events like what you went to. He's been in the business with his union for a bit now, worked up the ladder to doing lead gigs. Certainly helps to be living in a (relatively) big city! After this taste of GDC, I think I'll definitely have to make an effort to go to up to PAX.